Publisher: Geoffrey Nevine October 18, 2017 This information is provided solely as a guideline. 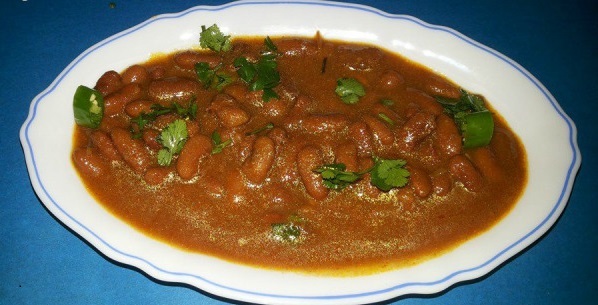 Today's recipe is a simple and interesting curry with beans which goes very well with rice and roti. We like to have this one as an accompaniment for rasam rice or any variety rice. ➥3-4 medium garlic + 1 inch ginger + 1 to 2 green chilies – crushed to a paste in a mortar-pestle, To ➥make about 1 tbsp. ginger-garlic-green chili paste. Rinse and soak the kidney beans in enough water overnight or for 8-9 hours. In a pressure cooker, add the beans and 4 cups water. Pressure cook on a medium to high flame for 15-20 minutes. When the beans are cooking, you can chop the onions, tomatoes etc. Check if the beans are well cooked by taking a bite or pressing a bean. If they are not cooked completely, then pressure cook again adding some water if required for some minutes. Then add onions and sauté them until they are caramelized or golden browned-take care not to burn them as this will impart bitter tones in the curry. Lightly browning the onions is also alright. Keep on stirring the onions while sautéing them, for uniform cooking and also so that they don’t get burnt. Add the ginger-garlic-chili paste. Stir and sauté for 5-10 seconds on a low flame. Add the tomatoes. Sauté for 2-3 minutes till the tomatoes become soft. Add all the spice powders one by one – turmeric powder, red chili powder, coriander powder, and garam masala powder. Use a slotted spoon or a strainer and remove the beans and add them to the masala. Save the stock. Stir and sauté for a minute longer. Take 1.5 to 2 cups from the stock and add to the beans. Add salt and stir the whole curry mixture. Simmer without a lid for 10-12 minutes or more till the curry thickens slightly. It should not be watery. Mash a few beans with the spoon-This helps to thicken the curry.